Living up to your expectations – everyday! Safe Haven Home For All knows what a great challenge it is to go through any transition in your life. Our home makes it possible for your loved one to be in a place where their declining independence won’t stand in the way of achieving a quality life. Expect great care from our team of caregivers who seek ways to give residents no less than the best possible care. We participate in the health management of our clients. Safe Haven Home For All is not just a place to live – it is a place to have a life. The strong reputation which we have already established is closely guarded by our staff as we maintain quality provision of care, comfortable accommodations and upholding the dignity of our residents. From the start, Safe Haven Home For All sought out to make a difference in the lives of the residents in our care. Our home is built specifically for individuals who are unable to live independently. 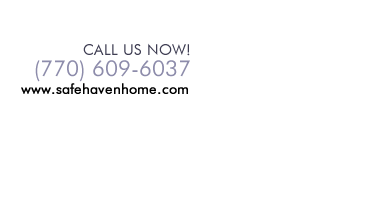 Safe Haven Home For All offers an attractive, welcoming and warm home atmosphere with accessibility requirements to ensure that residents are able to live comfortably and safely under our roof. To inquire about the admission process, please call (770) 609-6037. We will be happy to hear from you.